Our Bullseye Ball brings a new twist to the classic skee ball game. 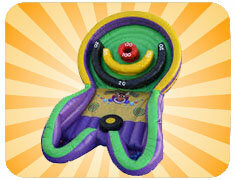 Players bounce balls off of the circular target to bounce they in to the scoring area! See how high you can score in this challenging game! 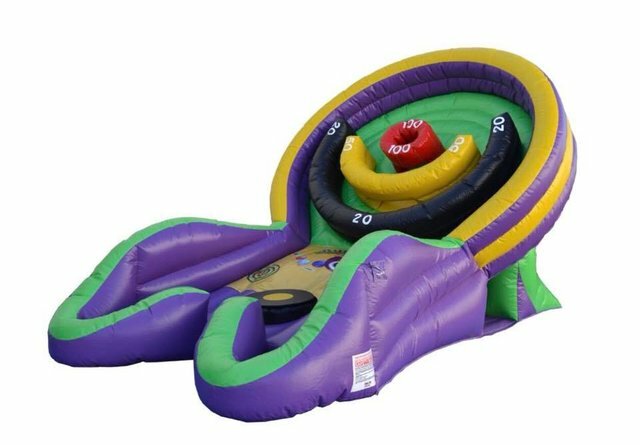 Our Bullseye Ball inflatable is 11 feet wide by 17 feet deep and is 10 feet high. One attended is required to monitor play while children are playing. This attendant can be someone that you provide, or Parties Inc. can provide an attendant at an additional cost. This inflatable can be set up on grass, a drive way, school black top, or inside a gym. A set up area of 17 feet wide by 19 feet deep by 15 feet high is required. A regular 15 amp circuit is equired with nothing else running on it. Normally, your back yard outlet will work fine! The bounce house must be plugged into the power source at all times during operation. For instances where power is not available, we have generators available for rental.